Mangalore Bajji: Mangalore bajji, as it is referred to in Karnataka (Golibaje in South Canara), is a popular food made from all purpose flour, curd, rice flour, chopped onion, coriander leaves, coconut, jeera, green chillies, and salt. The ingredients should be thoroughly mixed to form a hard batter, then shaped into a small ball and deep fried, preferably in coconut oil. It is often served with chutney. It is also called Golibaje in Tulu. Mangaloreans often eat this at tea time. Take the both flours in a bowl. Add in the curd, sugar, baking soda and salt. Slowly whisk the mix to form a thick paste. Add in the water and whisk well to make a batter. The batter for mangalore bajji should not be too thick or too runny. Cover the batter with plastic wrap; keep it in a warm place overnight. Note: If you don’t want to keep the batter overnight, keep the batter in a warm place for an hour. Add in the chopped coriander leaves, chopped ginger, chopped green chillies and cumin seeds. Add in the coconut pieces (don’t use grated coconut or desiccated coconut). Heat the oil for deep-frying, on medium heat to 180° C.
Drop a tablespoon of batter at a time, to the hot oil. Don’t overcrowd and fry in small batches. Fry on both sides until the mangalore bajji ‘s turns golden brown. Mangalore bajji’s are ready to be served. 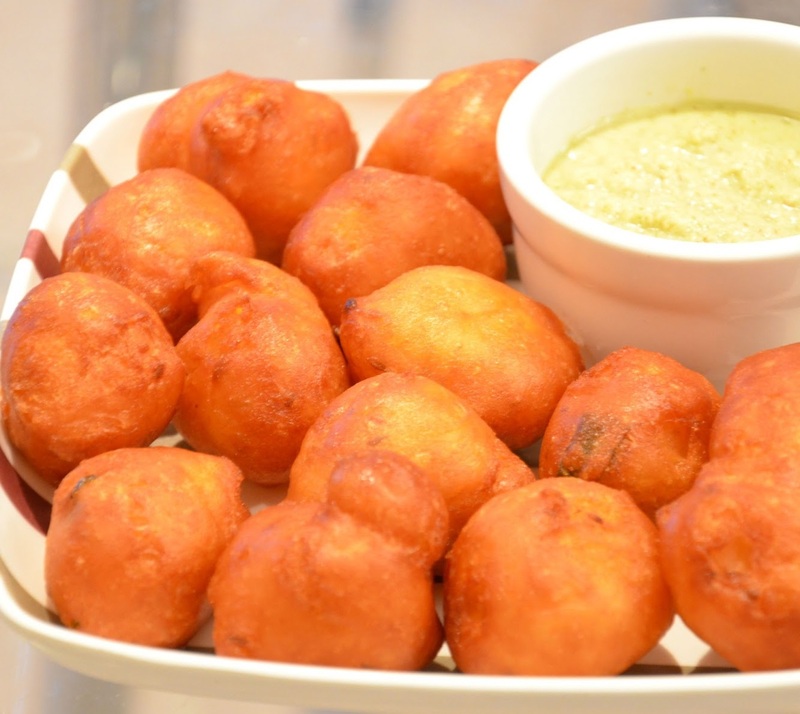 Serve hot mangalore bajji with coconut chutney or ketchup. If you have any queries regarding the Mangalore Bajji recipe, please leave a comment.